PHA Europe is excited to be the official charity partner of IRONMAN Frankfurt (July 5). Encourage donations to PHA Europe – help us to increase awareness of PH, promote optimal standards of care and encourage research for new medicines and therapies. Could PHA Europe become one of your company’s charity partners? Put us in touch with your corporate social responsibility representatives and your organization could help make a real difference to the lives of PH patients. Our participation at the IRONMAN races has allowed us to reach millions of people with our messages of hope and awareness of PH. Photos and highlights will be posted on this page after the race on July 5. Don’t forget to come back to see what we got up to! IRONMAN athletes tackle what is widely considered the toughest one-day endurance event in the world. The races start with a 3.8 km swim, followed by a 180.1 km bike ride and ends with a grueling 42.2 km run to the finish line! In 2013 PHA Europe approached the IRONMAN organization with a view to getting involved in their European Tour as charity partner in the context of the celebrations for World Pulmonary Hypertension Day (WPHD). For pulmonary hypertension patients, every day is like an IRONMAN race as even everyday activities, like climbing the stairs, can leave patients struggling to breathe so we thought this partnership would be a very good way to highlight the limitations of patients and raise awareness of the disease with a very broad audience. PHA Europe was the official charity partner for the 2013 and 2014 European Tours. 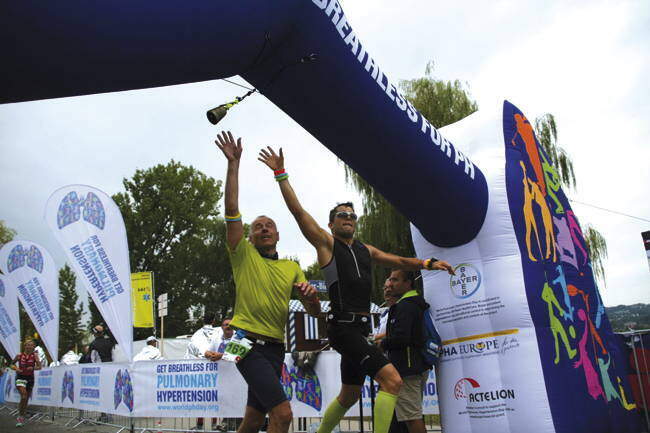 In 2014 PHA Europe was delighted to be the official charity partner of the IRONMAN European Tour for the second consecutive year, allowing us to propel pulmonary hypertension, a little-known, overlooked and yet life-threatening condition, onto the global sporting stage. We had a strong presence at IRONMAN Mallorca, Nice, Klagenfurt, Frankfurt, Zurich and Copenhagen – the six “official” races – and at Ironman Budapest, where we present thanks to the Hungarian PH association. Response from athletes and attendees was more encouraging than we could have ever imagined, with a total of 60 athletes running on behalf of our cause at the six official races and in Budapest, sporting the “Get Breathless for PH” race suits. During the races thousands of athletes ran under our “Get Breathless for PH” branded arch, ringing the bell to show support for PH patients and raising funds for local PH association. A “Get Breathless for PH” exhibition stand at all of these venues has also provided educational information to thousands of attendees. We are very happy with the awareness achieved at the events themselves through the new activities at the PHA Europe exibition stand, in particular the huge success of the lung function test, the athlete briefings, the pasta parties, the enthusiastic bell ringing of thousands of athletes (quantifiable thanks to the introduction of a counter), the announcements during the race, the number of athletes who were either racing for us, had their photo taken with our T-shirts or contributed in other ways to the cause, and the participation of the public at large. The possibility of having articles posted on the official Ironman race newsletters contributed significantly to increasing our outreach as did the posts on the Ironman website and social media channels. PHA Europe and national associations made good use of their online platforms and the campaign also benefited greatly from all the awareness activities around World PH Day as IRONMAN was consistenly mentioned as being an integral part of it. Thanks to our bright and colorful attendance at these races, our message reached up to a potential 1 million attendees and our articles in the official IRONMAN newsletters reached a readership of over 100.000. Last but not least, a very big thank you goes to all the volunteers from the member associations who helped us man the exibition desk, run the lung function test, distribute information materials and merchandising items and cheer the athletes on at the race courses! These volunteers represented 26 patient associations from 24 European countries, making our participation at Ironman 2914 a truly pan-European event.